Would you like to promote PFLAG Blue Ridge while supporting our work? 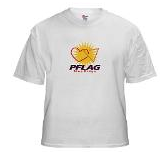 Visit the PFLAG Blue Ridge Store at CafePress to find shirts, stickers, magnets, calendars, mugs, water bottles, and other logo merchandise. All proceeds from the sales of these items go directly towards our mission of support, education, and advocacy (funding: printed materials for support group meetings and festivals, guest speakers and educational films, health advocacy efforts and workshops, website hosting and post office box fees). We are an all-volunteer organization and your support makes a difference! CafePress occasionally offers coupons and other sales that are valid in our PFLAG Blue Ridge Store. The banner below automatically updates with any current offers.